Enjoy stunning views of the Manhattan and Brooklyn skyline; discover the adjacent waterfront neighborhoods in Brooklyn. Most tours of the Brooklyn Bridge start in Manhattan and end in Brooklyn. I can and do lead such tours, starting near City Hall Park, then proceeding to DUMBO, Fulton Ferry, and Brooklyn Heights. However, as a Brooklyn-centric tour guide, I also recommend doing the opposite: start on the Brooklyn side. 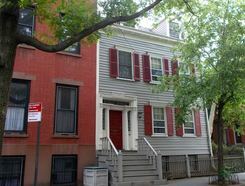 We'd start with a good walk through downtown Brooklyn and Brooklyn Heights, the city’s first landmarked neighborhood. Stops include the Brooklyn Heights Promenade and Brooklyn's most famous church, the Brooklyn Historical Society, and two private schools that serve. After a stop at Fulton Ferry (good ice cream and chocolate options, plus an intriguing echo of the bridge) and a few blocks in DUMBO, we see the new Brooklyn Bridge Park, built on old Port Authority piers and not without controversy. As we walk over the bridge, we get great views of the harbor and a chance to learn the bridge’s complicated, glorious history, the innovations behind it, and the family that oversaw it (and died/suffered during construction). Today, the Brooklyn Bridge remains a marvel and an icon, albeit one that requires ongoing repair. We end at City Hall Park, where there are many subway options, or a chance to walk around Lower Manhattan, including to Ground Zero. For those new to Brooklyn, please note this tour focuses only on a small piece of Brooklyn. For a more extensive introduction, I recommend the Brooklyn 101 tour, with the bridge as an add-on. After tour: You're in Manhattan!